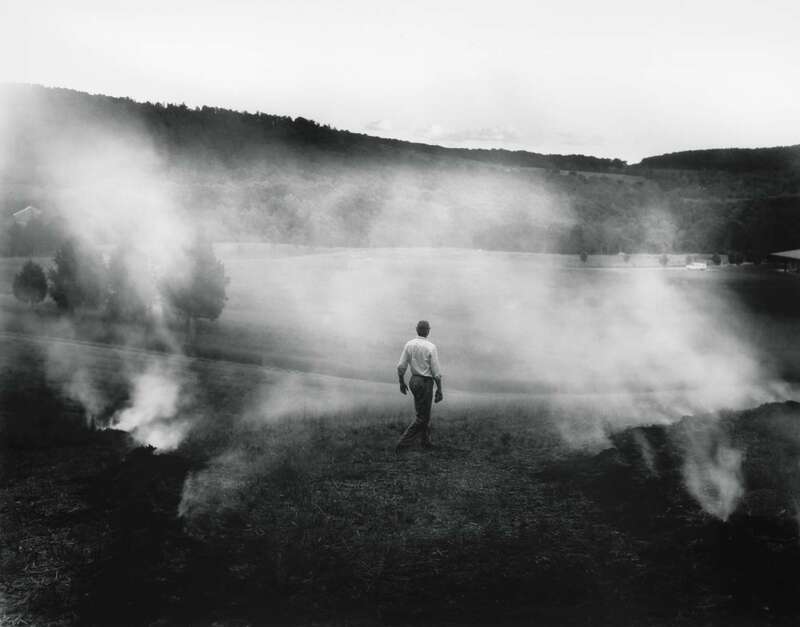 “The Ditch,” a 1987 photograph by Sally Mann at the start of her nearly 35-year retrospective exhibition at the J. Paul Getty Museum, sets the stage for much of what follows. Memory collides with forgetfulness in an image just ambiguous enough to pull viewers in and leave them hanging. Black and white, the entrancing picture shows a young boy lying on his back in a short, shallow, narrow trench that has been clawed into the earth beside a peaceful river. Six more children surround him, silently observing, although all but one of their heads are outside the frame or otherwise obscured. The one that isn’t looks directly at the camera — and through it at us, as if to see whether we are also closely observing. Another of the children is just emerging, naked or nearly so, from the water at the far end of the ditch. At the near end, a burst of radiant sunlight glows reflected in the watery foreground puddle. The photograph’s darkly shadowed edges use tonality to focus concentration on the pictorial center. Our viewpoint is almost voyeuristic, as if caught in the act of spying on a furtive event. This image of kids at play on an ordinary summer day unfurls as a multivalent metaphor for birth — for the delivery of a child into a world where others have gone before. The topical subject is further layered with a suggested epic that stretches to the dawn of time: We stand atop an evolutionary lineage that began tens of millions of years ago when fish developed limbs and tetrapods first crawled onto land from out of the sea. Here, those evolutionary limbs also play a retrogressive role. The legs and arms of the boy lying in the ditch are bent beneath his torso, hidden from view. Corpse-like, a body with severed limbs and cast into a trench is a discreet echo of renowned wartime photographs that chronicle brutal carnage. Roger Fenton’s were shot at Sebastopol on the Crimean Peninsula in 1855, Florence Farmborough’s on the Russian Front during World War I. Most immediately for Mann, who was born and has lived most of her 67 years in Lexington, Va., Alexander Gardner’s famous battlefield pictures date to the aftermath of Gettysburg and Antietam. A quiet shock of recognition unfolds, death entering an otherwise sunny summer picture, its intimations of birth and human evolution now joined by insinuations of the grave. Mann’s photograph was self-evidently composed (unlike some of Gardner’s Civil War pictures, which concealed the artist’s occasional manipulation of the scene). She’s a visual storyteller — the show’s title, “A Thousand Crossings,” comes from the Scottish poet John Glenday — and her work forthrightly partakes of the romantic, sometimes even Gothic expressionism that often characterizes Southern literary traditions. Her subject is always the legacy of the American South, which includes her family.